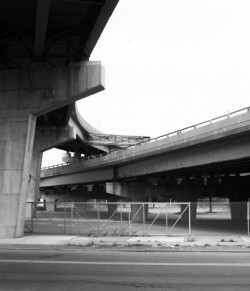 The School of Architecture and the Maxwell School of Citizenship and Public Affairs are joining together to co-host an interdisciplinary symposium, “Future Infrastructures: The Over and Under of I-81,” on Thursday, March 22, from 4-6 pm in Slocum Hall Auditorium. The event aims to provide a valuable, fresh perspective to what has already been a long, hotly debated topic within the greater Syracuse community and similarly experienced by many other cities in the U.S. and worldwide. “Future Infrastructures” will focus on the choices for renovating or re-routing the I-81 elevated highway in Syracuse from both an urban design and public policy perspective. What separates this forum from many others is the coming together of nationally recognized urban design and planning experts in conversation with voices from public policy and political contingents. Panelists for the event include: economist Joseph Kane, senior research associate and associate fellow from the Brookings Institution’s Metropolitan Policy Program; Alex Krieger, professor in practice of Urban Design at Harvard University’s Graduate School of Design; Jonnell Robinson, a social geographer and assistant professor of geography at the Maxwell School of Citizenship and Public Affairs; and Ben Walsh, mayor of the City of Syracuse. Grant Reeher, director of the Campbell Public Affairs Institute at the Maxwell School, will moderate the discussion. This event is free and open to the public. For special accessibility concerns, please contact Deb Witter-Gamba: dwitterg@syr.edu; 315.443.0790.